A beautifully carved Teak Palanquin with brass strap work decoration. Having open gallery sides decorated with pierced fret work. With a woven fabric base, raised on turned Teak feet. 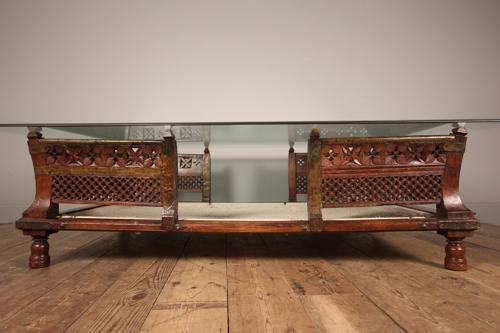 Adapted as a coffee table with a bevelled glass top. Great proportions with ample storage for books, magazines etc.